Joel Bowman: Good morning, Doug. Thanks for taking the time to talk. Where in the world do we find you today? JB: Agreed. 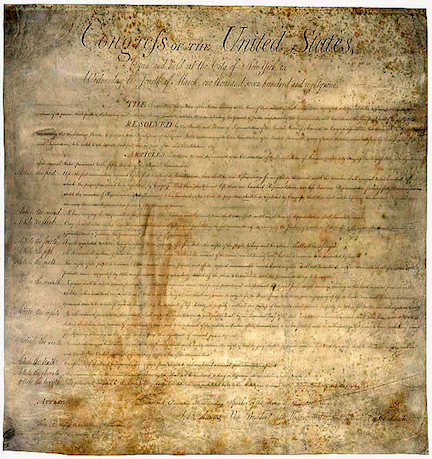 On just that point, today we’re kicking off the first in a series of conversations regarding the real state of the union, whereby we’ll go through the first ten amendments to the Constitution, known as the Bill of Rights, and see how the United States scores against the ideals laid out by its own founding documents. Would you like to get the ball rolling for us? DC: Sure thing. The Bill of Rights is one of the most important—perhaps the most important—political documents ever written. It’s the first time, to my knowledge, the rights of an individual were spelled out clearly, and the actions of the State clearly limited. Of course there’s the English Magna Carta. But it dealt with only a few rights for a few people. I’m not a great fan of the Constitution itself. The case can be made that it was the result of a coup d’etat—as shocking as that may be for the average American to hear. The constitutional convention was meant only to amend some problems with the Articles of Confederation, not discard the whole document. And the Constitution basically concerns itself only with how the government is run—structure, powers, and trivia like the Vice-President breaking ties in the Senate. However only the Bill of Rights legally guarantees the rights of the individual against the State. Perversely, it’s been greatly weakened in that role. While it’s now heavily applied against other individuals, companies, and local governments—when it was strictly a compact regarding the national government. JB: Though International Man readers will mostly be familiar with this document, we might go ahead and print it here anyway; they may wish to forward these articles along to friends or associates for whom the words may not be so easily recalled. Broadly speaking, we might break this into four semi-discrete parts, loosely termed; Freedom of Religion, Freedom of Speech, Freedom of the Press and Freedom of Assembly and of Petition for Redress. Given this backdrop, how do you think the Founding Fathers might view the current state of affairs? Just how robust is that separation of church and state today, in 2018? DC: It's not in nearly as much trouble as the rest of the First Amendment, most of which has become a dead letter over the years. It’s been interpreted out of existence by the Supreme Court. And regarded just as theory, because it’s compromised by hundreds of laws and regulations. But we’re talking about the religion clause in particular here. As far as what was in the framers' minds at that time, many of them were deists. More than a few agnostics and a few atheists, although then as now you're not supposed to say that out loud. Atheists are among the least trusted and most disliked of all Americans. But, that said, in those days, America was a Christian nation. The culture was generally Christian. That’s changing rapidly, although America is still the most religious major country in the West. I'm not a Christian, but it's interesting that now, if you do proclaim that you are a Christian, people assume that you're part of the fundamental fringe. If you say things that are anti-Christian, however, you’re on safe ground. But the whole freedom of religion concept has been perverted in such a way that if you say anything that is anti-Islamic, you're liable to some kind of ... well, not prosecution in the U.S., but severe social opprobrium. Although you are liable to prosecution in Canada and Europe for saying anything that's against the Prophet or his religion. It’s a sign of a change in the culture—which is much more important than a change in the laws. People in the US, and the West in general, seem to have lost faith in their civilization. And treating Mohammedanism—an alien religion, whose beliefs are largely at odds with the Bill of Rights—with more respect than the country’s traditional religion is a bad sign. US culture has mutated since the 1960’s. And it's going to change further as people in the U.S. fall away from Christianity, as they have in Europe. Christianity is on its way out. We can discuss whether that’s good or bad another time. But since people seem to need religion, it's going be replaced by something. And I suspect it's going be replaced by Mohammedanism. You may or may not like Christianity, but—at least in its current form—it’s generally compatible with American values. That’s absolutely untrue about Islam. The Bill of Rights guarantees followers of Mohammed freedom of religion. The problem is that Mohammedanism itself totally circumscribes freedom of religion, freedom of speech, and most other freedoms. Sharia law is antithetical to Western Civilization in general, and the Bill of Rights in particular. It’s a conundrum. I’m afraid that the US—in the pursuit of Political Correctness—will wind up destroying itself. Although you brought a good point up. The fact that it says “In God We Trust” on the money shows that religion is—or once was—widely accepted in the US. Part of the national fabric. It’s actually been the official national motto since 1956, replacing “E Pluribus Unum”. People have argued about this forever, but—as someone who believes words mean exactly what they say—I’d say that's a violation of the Constitution in itself. It's one thing to have a Christian culture in the country and another thing for the government to, on the national money, be promoting the concept of god. Which god? Is it Jesus? Is it Yahweh? Is it Allah? Or perhaps some other god. But in any event, it shouldn't be a motto, or on the money. Of course the fact the Constitution says that only gold and silver are to be used as money—not a national paper currency—brings up another problem entirely. I might add that when something—a concept, an institution, a religion, anything—gets very vociferous, very “in your face”, it’s usually a sign of fear, even desperation. That’s when laws get passed and mottos promoted in an attempt to hold the old order together. America was at a peak in 1956, with commonly accepted values on pretty much all fronts. Ten years later it was in the middle of a cultural revolution, at least around the fringes. Now, 60 years later, it’s much more serious. JB: Some academics have even suggested that the constitution itself has become the cornerstone of a kind of “civic religion.” Thomas Jefferson (who was almost certainly a deist, if not an atheist) worried about this when, in 1816, he wrote, "Some men look at constitutions with sanctimonious reverence and deem them like the Ark of the Covenant, too sacred to be touched." DC: I think that's an excellent point. Hans-Hermann Hoppe wrote a book called Democracy: The God That Failed. I think he's absolutely right. The idea of democracy has become a secular religion. The US feels it has to send Crusaders out to convert the heathen in the Third World. It almost seems we’re looking at a shadow of the 4th, 5th, and 6th centuries, when traditional religions in Europe were replaced by Christianity. Whether it’s Mohammedanism or some secular religion like democracy, or Political Correctness, the government should be “hands off”. By that I mean that since the government is all about force, it should be limited to only protecting people in its bailiwick from force. That implies a police force, a military, and a court system—at most. You can argue that those three things are too important to be left to the kind of people who are typically employed by the government. But that’s another subject for another time. Back in the day, people used to go to church at least on the Sabbath, if not every day. People are no longer tied to religion that way. It seems that the State has replaced god as a cornucopia that can give you everything that you want, and punish you if you're not good. The entire ambiance of the country has changed in relation to religion. JB: If you had to award a grade to the U.S. on its adherence to Freedom of Religion, how do you think it would score? DC: It actually gets a fairly high mark, perhaps a B+. Absolutely relative to most other countries, which get somewhere between a C and an F. Most of Europe supplies State subsidies to churches. The Islamic world either subtly or very overtly promotes Mohammedanism. India has lots of laws favoring Hinduism. China has an active campaign against religion, especially Islam. I expect churches could lose their tax exemptions as the government becomes really strained for cash in the coming years. But should they ever have had an exemption to start with? Isn’t that the State favoring religion? The real test for America will come when Muslims, who are growing rapidly in number, and concentrating in certain areas, start pushing for elements of Sharia law, perversely using the First Amendment as a lever. JB: Thanks for your thoughts, Doug. Let’s pick it up again next week with the second provision, the once-known Freedom of Speech.